The lowest in almost two years The Czech manufacturing Purchasing Managers' Index (PMI) dropped to 53.4 points in September, the lowest level since November 2016 and missing market expectations of 54.4. According to Markit, the PMI's drop was largely due to slow growth in new orders, which was the weakest in almost two years. The results of the survey also indicate a slower rise in both output and employment. Cost pressures increased as energy, fuel and metal prices increased. As a result, output prices also accelerated above the long-term average. The manufacturing PMI has been gradually declining this year from 59.8 points in January to the current level of less than 54. The average level of the PMI in the third quarter, at 54.6 points, is also the lowest since the fourth quarter of 2016 when it hit 53.1. The domestic PMI gradually follows the development of manufacturing PMIs in the euro area and Germany, which also surprised on the downside in September, reaching the lowest level in the last two years (see chart). The Czech PMI is below the average of the past year but still remains well above the key 50- level signalling growth. As such, the overall conditions in the domestic manufacturing sector continue to improve, just at a slightly slower pace. The value of the past few months have been significantly weaker compared to the turn of the year, but they're still close to the four-year average (55.5 points). For example, in mid-2016, the PMI hit 50 and the average for the whole of 2016 was just 53. The uncertainty about trade wars is denting manufacturers’ optimism about the coming year and these worsening expectations have put pressure on the PMI. As such, the latest weaker Czech PMI data is consistent with the expectation that domestic industrial production, after 6.5% growth last year, will slow down to 3% this year on the back of a high base, stretched capacity and weaker foreign demand. 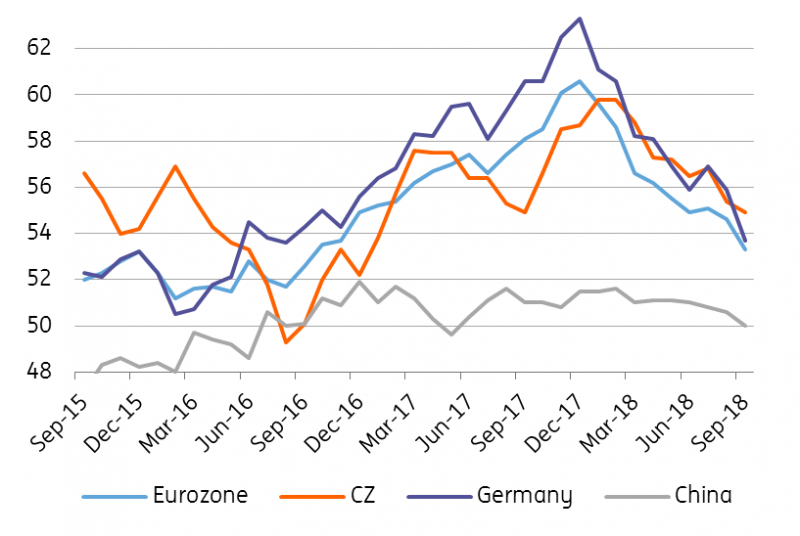 This means that recent developments in the Czech PMI should not change the Czech National Bank's intention to gradually tighten monetary conditions.